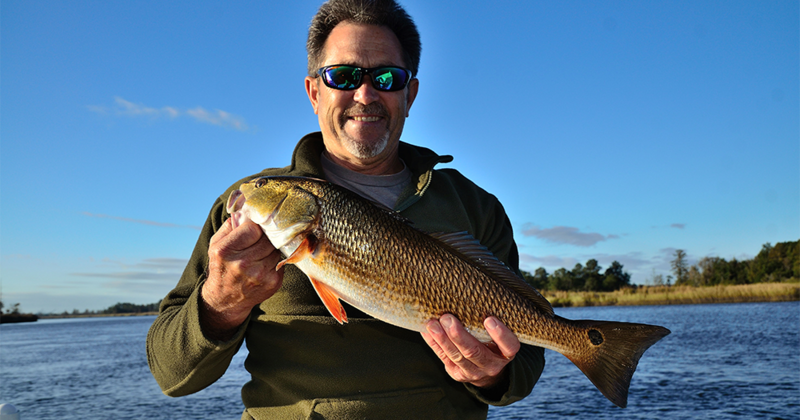 Everything cranks up during the fall of the year and the redfish are no exception. Depending on where you are from, redfish get a long list of names, including: spot-tailed bass, puppy drum, red drum, channel bass, or just reds. Falling water temperatures shifts the baitfish and shrimp around towards the bigger waters that makes the redfish perk up and feed aggressively. Redfish are the most popular inshore saltwater game fish in North America surpassing flounder, trout, stripers, and bluefish by a long shot. Redfish are the only inshore species to have a National tournament trail spanning across the Atlantic and Gulf States called the Inshore Fishing Association’s (IFA) Redfish Tour. And while these tournament pros can bring a hefty bag of fish back to the scales every month of the year, they can’t argue with the fact that fall fishing is the premiere hour to be fishing along the Carolina Coastline for these bronzed beasts. 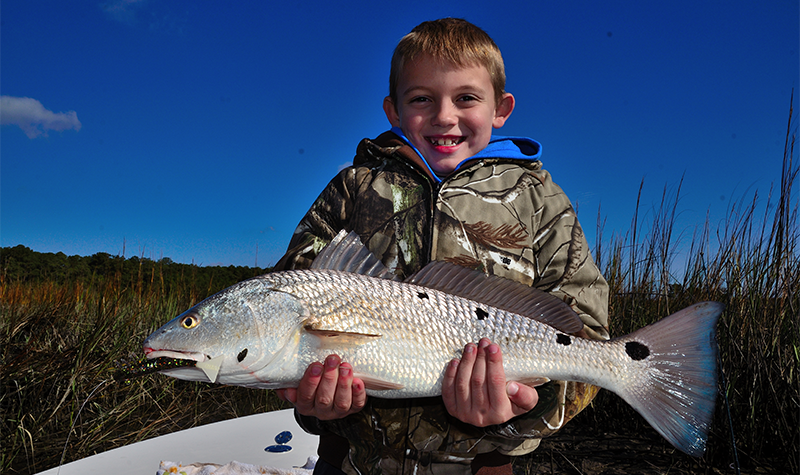 Redfishing during the fall along the Carolinas come in two categories, including: bull reds and juvenile reds. 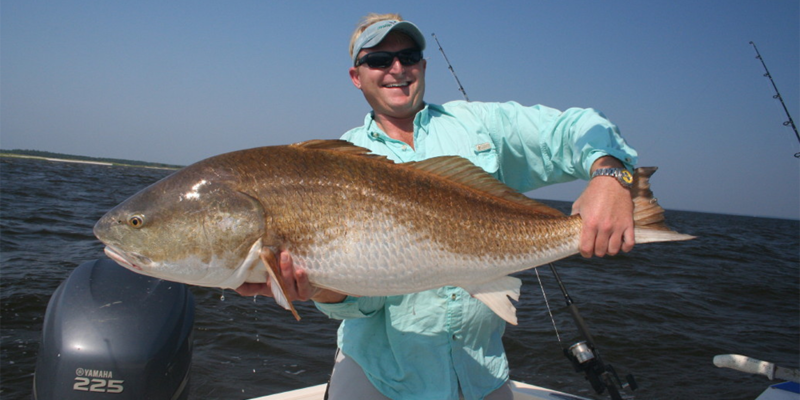 Bull redfish are the extra large males that migrate into Carolina waters during the fall season. The bulls are essentially large males that exceed 36 inches in length. But, the bulls that visit the Carolina coast can exceed 36 inches by a long shot. In fact, most bull reds caught this time of year are between 40 and 60 inches. The juveniles aren’t anything to shy away from either. Redfish are considered juveniles when they are less than 36 inches in length. But, I can tell you, a 30-inch redfish will exceed 10 pounds and is nothing to shy away from. 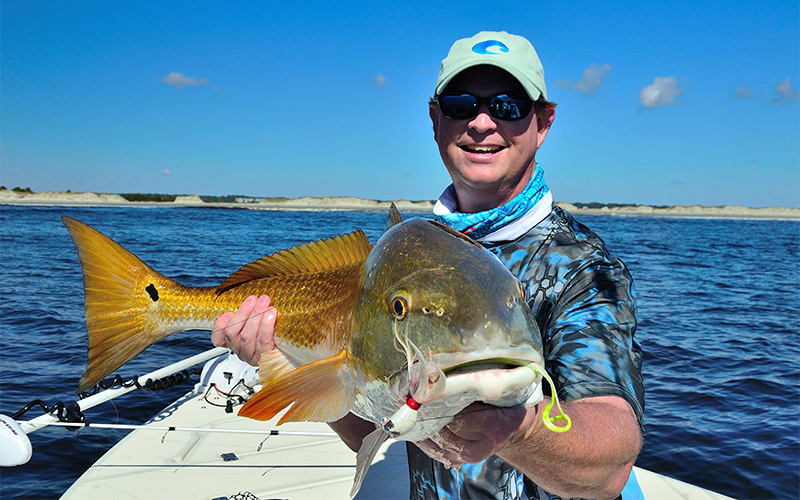 The main difference between the two categories of redfish is where to find them. Generally, the bull reds are nearshore in the ocean, at the jetties, in the main river channels, or located within any large bay system not too far from the ocean. Juvenile redfish can be in a wide variety of places from the rock jetties along the ocean front to the extreme shallows of the marshes or well upstream within brackish river systems. Redfish prey on shrimp, mullet, crabs, and any type of fish they can fit in their mouths. The fall season ramps up and both the bull reds and juvenile reds accelerate their feeding behaviors looking for any opportunity to feed. Juvenile redfish share some commonality with speckled trout in the fall since they are after the same forage base and live in predominantly the same habitats. Redfish share the same ambush positions as trout and flounder this time of year and an angler can catch flounder, redfish, and trout all in the same habitat and with most of the same lures. Redfish are much like trout in that they love to eat shrimp and small fish, but redfish absolutely love blue crabs. Redfish will travel into super skinny water to gobble up a blue crab every month of the year. Redfish live much of the year in the marsh and well into the beginning of shallow tidal creeks. Redfish are at home in the shallows miles away from deep water. And fall conditions make redfishing a good reason to get out in the cold weather. This time of year, redfish will associate with any kind of structure, including: rocks, docks, grass edges, and anything covered in oysters. The submerged structures offer excellent places for redfish to forage. And the best structures are places with moving water along the main creeks and open bays with a significant water flow. 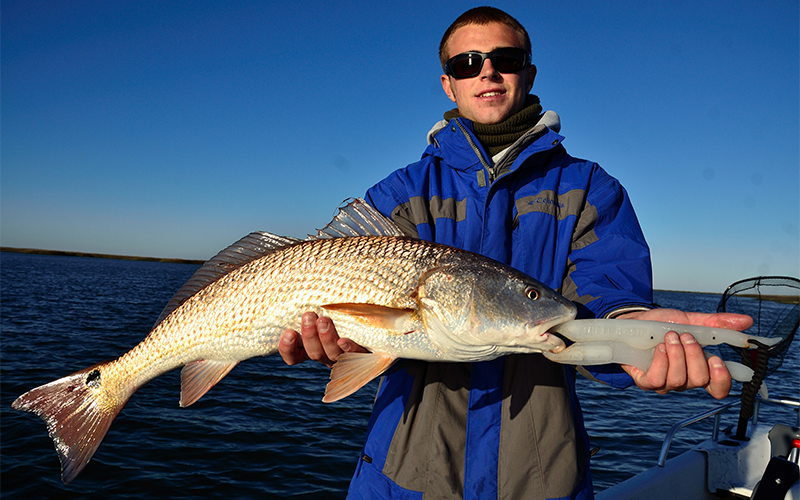 The weather affects redfish much like many other inshore fishes. Redfish change their stance and shift to the mouths of creeks and other places to pick off the passing baitfish and shrimp. In addition, redfish gang up into bigger groups as the water temperature falls. 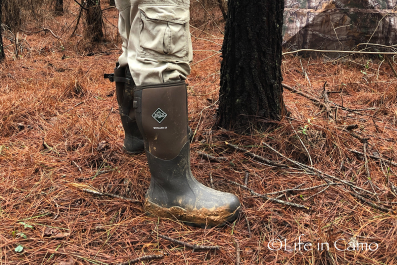 Redfish will gather in schools from 20 to over 50 fish and as the water heads to seasonal lows, they will congregate into even larger schools in the shallow backcountry waters. Since redfish are eating a combination of small fish, shrimp, and crabs, a wide variety of artificial lures that mimic their daily diet will produce a strike. And anglers shouldn’t ignore natural baits either. Redfish will readily eat live minnows and live shrimp without hesitation. Redfish are the least picky of all inshore game fish where pieces of cut fish, frozen shrimp, and chunks of blue crab will easily function as a reliable bait choice. Don’t let the name fool you, juvenile redfish are far from puny. A juvenile redfish can battle to the bitter end without letting up and a powerful fishing rod and reel system are required to wrestle this famed fish into the boat. Anglers sometimes need the best of both worlds for a rod and reel set up. Reels need a powerful, but smooth drag system, because redfish will sure gain some ground when the whistle blows and a tug-a-war game is in session. Shimano’s 4000 series Exsence is a good choice for redfish anglers. It is constructed of a bulletproof magnesium HAGANE body that is saltwater ready and provides the extremely smooth drag needed for the short bursts of speed redfish are known for. In addition to the solid construction, the Exsence is extremely lightweight that is a pre-requisite for today’s top shelf anglers. Light weight rods and reels increase sensitivity to make sure no bites are missed. While reels are important for taming a redfish to the boat, a rod with a sensitive tip and with unmatched power is a requirement. Shimano’s Curado Series is light, sensitive and does an amazing job for working redfish in the unforgiving saltwater terrain. The Curado comes in five different models and the 85-inch models in medium action and a fast action tip are perfect for juvenile redfish. Tame Bull Reds: The Big Boys! 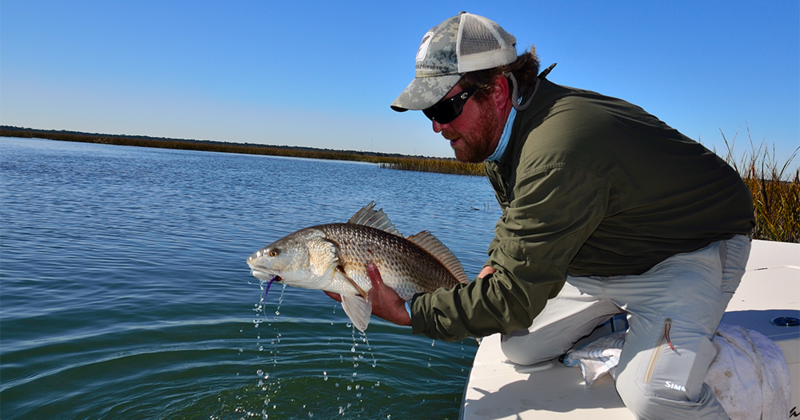 The fall flurry of bull redfish show up in early fall for four to six weeks along their migratory route. Anglers have the best luck with bull reds by using live menhaden, live mullet, cut bait on the bottom or artificial lures, such as: heavy buck-tail jigs, jigging spoons, or large swim baits jigged on the bottom. Bull reds are massive powerhouses that require a stout rod and reel set up. Spinning reels are best suited for casting lures or baits to bull reds and the Shimano Stella SW 8000, 6000 or 5000 series are prime examples of reels with extreme power and tenacity to handle the brute strength of bull reds on the other end of the line. Pair the Stella SW with a Tallus Blue Water Spinning rod and the bull reds will not know what hit them. The bulls show up in fairly big schools sometimes exceeding 50 to 100 fish per school. When the fish show up, multiple fish can be caught without much effort. The bulls are rarely too finicky when they show up. They generally will tail the big schools of menhaden and mullet down the coast and into the major river systems. One of the best tactics to find bull reds is to find the big pods of menhaden and cast lures or live bait into them. If the fish are there, anglers will hook up fairly quickly. 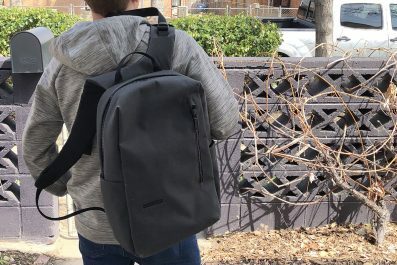 If no bites in 10-20 minutes, anglers should move on to the next school. Or anglers can set up in the main river channel along any irregularity in the bottom or at the jetties on a moving tide. Bull reds aren’t available long in Carolina waters and when they arrive, they can be lots of fun. But, heavy tackle is recommended like the Shimano Stella SW/Tallus Blue Water Spinning combo to get the fish in swiftly to provide a quick release back to the water. These big bulls are the breeder fishes and they need to be allowed a quick recovery to promote the species.